Last night I had the pleasure of attending a Nokia Nseries Open To Anything event in San Francisco hosted by the great folks at WOM World/ Nokia. The intimate gathering at Absinthe Brasserie and Bar brought together a group of Bay Area bloggers and three representatives of London based WOM World, a Nokia sponsored site that is the center of the company’s blogger relations program. It was a free ranging, informal session where the locals shared their enthusiasm for S60 phones, especially the N95 and their frustration with Nokia’s low profile in the US market. The “formal” part of the evening included showing a couple of Nokia’s “Open to Anything” video ads and demos of some great free S60 applications. The videos; “Lie Detector”, about the wife who turns her N95 into a polygraph to keep her husband on the straight and narrow and “The Magician“, which features a incompetent illusionist who uses Nokia Maps to get his bearings because he “never knows where he will turn up” after he does his disappearing act were actually pretty funny though I gotta question whether they will sell many phones. I thought the demos were much more effective at showing the power of S60, by using free, mostly 3rd party software to do things that no other phone (especially not the 3G iPhone) can do. tnkgrl demoed Qik by streaming a video of the event live to the web using just her N95-3. It worked in spite of the restaurant’s non-existent 3G and flaky WiFi. She then showed JoikuSpot which turns an S60 phone into a WiFi router to share the phone’s 3G (actually Edge thanks to ATT’s lousy coverage) with other devices. With her N95 sitting in the restaurant’s window 30 feet away, tnkgrl and several of us used JoikuSpot’s signal to surf the web on our laptops. Yahoo Mobile developer Rahul Nair shared two of the apps he worked on at Yahoo’s Berkeley Research Lab. The first, Zonetag uploads photos to Flickr, sort of like Shozu but with a difference, it geo tags them with coordinates from tower locations or GPS and suggests tags based on nearby points of interest. The other Yahoo app Rahul showed was Zurfer, a location based photo browser which builds on ZoneTag to display Flickr photos taken near your current location. A couple of very cool applications. The last demo was by Ken Wronkiewicz, a talented artist and photographer who used Shozu, Share Online and a 10 line server-side script to create a “Photo Stacker”. Ken shot a video with an N95 and sent it to his server using Shozu where the script extracted the individual frames to create a still photo montage and upload it to Flickr. When the demos were over Siobhan from WOM World asked us for thoughts on what Nokia needed to do to sell more S60’s in the US. This turned into quite a ranting session with the WOM folks getting an earful. 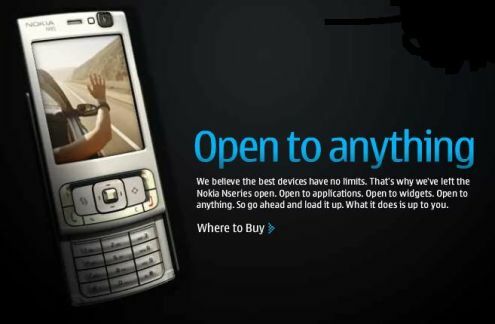 The bloggers were pretty harsh in their criticism of Nokia’s past efforts here and suggested: more high spec phones with US frequencies at lower prices, getting more phones onto the carriers because that’s the only way to sell in volume in this market. But carrier placement is difficult and branded phones tend to be badly crippled in the US so it was also suggested that Nokia make a serious effort to sell direct to consumers which attractive pricing, no hassle ordering and superior after sale support. Nokia’s US advertising got a real drubbing for being non-existent and ineffective. Nokia needs ads more like the iPhone’s, dead simple and showing just one awesome capability of the phone per ad. It was an evening of great food, good wine and lively discussion. I left with the feeling that we had not only had a good time but that perhaps we gave back to Nokia a little bit of market intelligence which might help to bring Nokia and S60 to the prominence in the US market that both it and US consumers deserve. Thank you Colin, Richard and Siobhan for your hospitality and williness to listen. This entry was posted in Events, Site Reviews and tagged advertising, Nokia, Nseries, s60 by Dennis Bournique. Bookmark the permalink. Thanks for the recap, Dennis – I’m going to link to it! Yeah it was really nice to see everyone, eat good food, and watch some interesting presentations. The rants on Nokia’s approach to the US market were a bit painful but quite justified I think.